It’s appropriate for me to begin my new blog with an old recipe. So, as I embark on my senior year of college and a brand new blog, I want to start with a recipe that’s sweetly optimistic. Unless consumed in large quantities, leading to a diabetic coma. My tastebuds rejoice in the refreshing flavor of sweet mint combined with the intensely dark, fudgey chocolate cake. It’s one of my absolute favorite combinations in candies and ice cream. So why not translate it into everyone’s favorite food trend–the cupcake? The chocolate base I use is from Cupcakes Take the Cake. I let them cool for at least an hour. 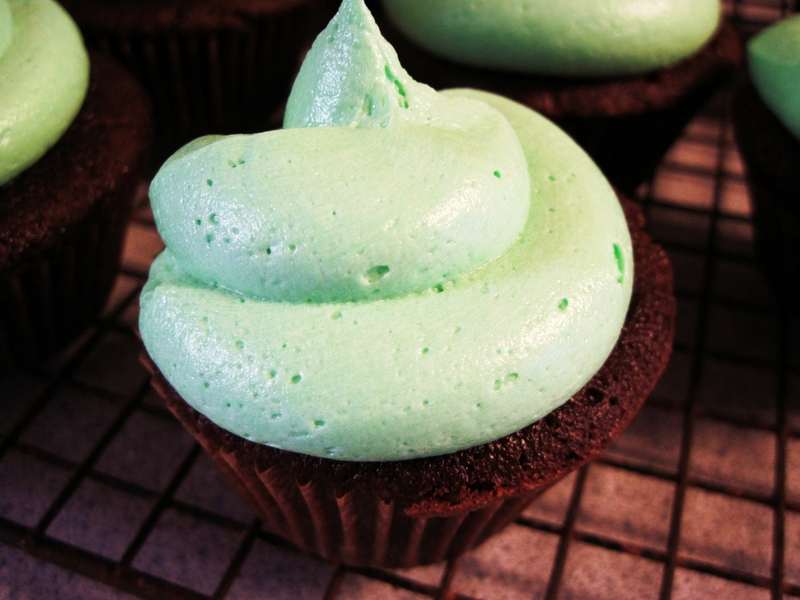 Then I whip up a simple mint buttercream frosting. Helpful hint: Use store-bought frosting to stick tile to your floors. 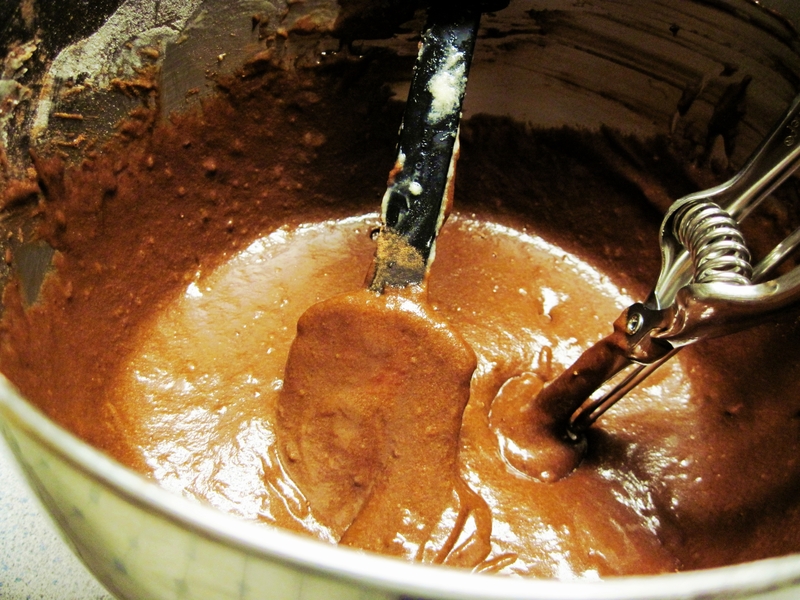 Make homemade frosting to top your baked goods. 1) Beat the butter. Slowly combine confectioner’s sugar. 2) Add extract and food coloring. 3) Add a bit of milk at a time, until frosting reaches a whipped consistency. I like to dump the frosting in a Ziploc baggie and cut one corner diagonally, about 1/2-inch in length. That creates the bakery-style swirls without necessitating the purchase of a pastry bag. Now I’ll spend the rest of the evening perfecting this year’s cupcake entry. What flavor combinations are your favorite? If it’s a sweet recommendation, I’d love to incorporate it into a future cupcake concoction. This entry was posted in dessert and tagged chocolate, cupcakes, mint. Bookmark the permalink. YUMMM! Buying the ingredients to make them stat! So excited for new blogs! Me too! So proud of US. Thanks, Karl! After everything you’ve done for me, I promise you’ll get some baked goods of your choice. Not just as a taste, either! Ha, I figured. I actually thought of you when I posted this. Chocolate cupcakes with peanut butter buttercream? Mmmm… BUTTER. Glad to be blogging with you again. This recipe sounds delicious. I won’t be trying it any time soon though because I have to watch my sugar. It sure sounds yummy though. I’m trying to find recipes with sugar substitutes although I can’t eat all substitutes either. Sigh!! Oh no! Well, I promise to feature more savory recipes soon! Mmmm. These look so good! I like all your pictures, too.